Fan Question: “Grounded Vindaloop” is definitely one of my favorite new episodes you guys have done. How long did it take to shoot that live-action scene with the boys? Answer: Great question! That live-action scene of the boys was actually done — start to finish — all within our crazy 6-day production schedule. In fact, the writers didn’t come up with the live action idea until Saturday afternoon. Which meant we only had 60 hours to build the set, find costumes, audition actors, hire a film crew, and shoot/edit this scene. 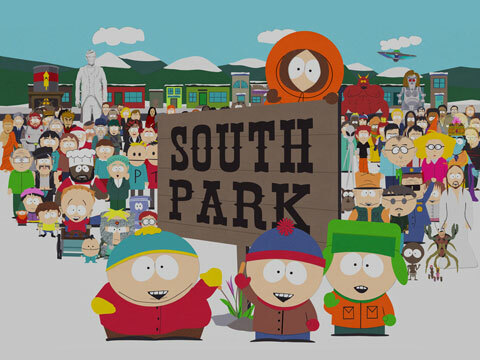 Once hired, the crew constructed the sets in one of our conference rooms at South Park Studios. We filmed on Tuesday, the day before the show premiered, and finished shooting the scene around 6pm… Just 28 hours before air. Trey did not want the live action to look cartoony, so all the bright colors of Cartman’s bedroom were muted and toned down. >> See the finished version of this scene here. >> Get lost in virtual reality & watch the full episode “Grounded Vindaloop“.